I have some staunch book haters this year. Some kids who really hate reading. Some of them hate writing as well. And not just in a “7th grade trying to be cool” kind of way, but in a deep-seated notion that rules their decisions, their actions, and their days. They hate reading. And they are telling me loudly. They are pushing me to think about what I do in our classroom. How I try to wrap them up in the excitement, how my own relentless quest to find that perfect book along with them is one that deserves the time it gets. 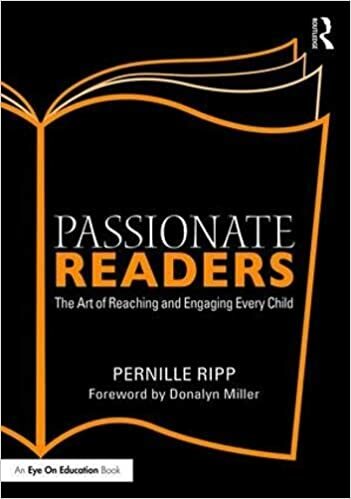 That the very act of loving reading (or writing or math or science) is something that we must find the time to cultivate in our schools. Even when I feel the pressure of the year and the deadlines looming over me. Because when they hate reading (or insert whatever school related subject here) then it just doesn’t matter what strategies I try to teach them. When they hate reading then it just doesn’t matter that I am trying to teach them how to think deeper about text. It just doesn’t matter that I am trying to teach them to find the signposts. It just doesn’t matter that I am trying to teach them how to write about their thoughts. How to access harder texts. How to understand text features or write a summary. How to analyze rather than paraphrase. When they hate reading then that is all they can think about. They refuse to access the skills that they need to practice because everything we do is attached to something to something they hate. And I get it, why would you want to do more with something you despise? So when they hate reading we must attack that first. Not the strategies, not the skills, but the emotion that is attached to everything we are trying to do. We must dig and dig and dig to find out why. And we must ask, and we must talk, and we must give them a chance to change their mind, if even just in the slightest way, as we create classrooms that are run on a culture of love for our subject, rather than a need to cover curriculum. We can assume that they hate it because it is hard. We can assume that they hate it because they find it boring. That they hate it because they have to sit still, because they cannot focus, because they would rather be doing so many other things. But we won’t know until we ask. We wont know until we acknowledge the hatred or whatever emotion they carry so that we can do something about it. Too often we barrel on, hoping that within our teaching something magical will happen. 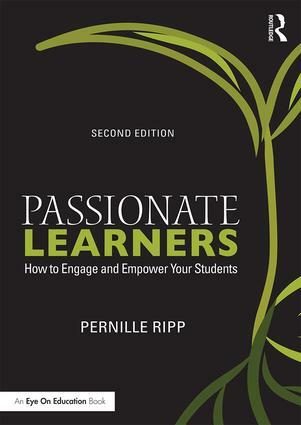 Yet within our race to teach to the standards, to explore the strategies, to cover, cover, cover, we cannot forget to develop the love, develop the relationship that students need to have with what we teach so that can become invested, even if just a little bit. 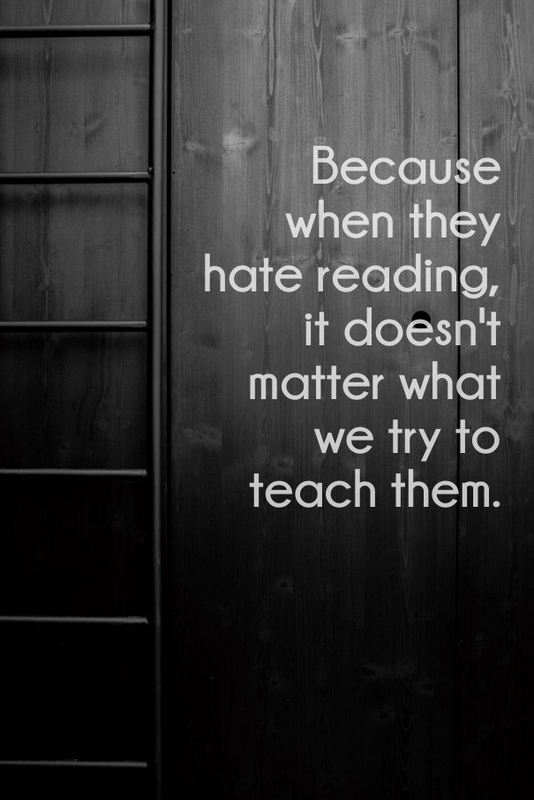 So when they hate reading, or whatever other thing they loudly proclaim to hate, don’t just teach. Listen. Ask. And then do something about it. And not just by yourself, but with them. YES! I have been preaching this over the past two weeks to those I work with, too. YES! I especially resonate with the busyness we contend with both with fulfilling curriculum requirements and test pressure. To me, it is harder than ever to cultivate a love of reading in our students–particularly our secondary ones–not because there aren’t fabulous books out there, but because our world spins so very fast for them (and for us). It is far easier to zone out scrolling through social media than to pick up a novel and let the magic happen—-and when you don’t already LOVE to read it is next to impossible. It requires time–something we have forgotten we have. I think the mere fact that reading is both taught in school and required to get through school drives kids to hate reading. We set kids to a schedule, tell them they must read at a given level by a certain time, and then brand the ones who don’t meet expectations as defective and in need of special education. And then we wonder why Johnny won’t read. Don’t think any of us enjoy something we find too challenging or tedious. Supporting kids to love reading is a life long gift bestowed upon them. Understand your challenge Pernille and your frustration and feeling of helplessness. Agree, we need to try and grab the time to find out why they hate reading and try to support them as best we can. Not an easy task. In my experience it is mainly the students who just can’t read and comprehend. So why read? I am totally non-mechanically minded. Hate reading instructions so I never do! where she could simply listen to the story and follow if she wished. Initially, she just listened and did not open the picture book. She was able to retell and share the text with others – something she shied away from. Her confidence slowly crept in. Watched her start to open the book and glance at the illustrations while she listened. Watched her begin to glance at the words on the page. Watched her share the content with her peers. Watched her confidence begin to soar. She still scores poorly on our standardised reading tests. So what! She is beginning to want to read…. I teach students (1st-4th)with learning disorders/disabilities such as dyslexia, and I have students who hate reading because it is so hard for them. They don’t learn in the traditional way reading is taught, so they come to me for reading instruction. I know they need to learn how to read, but I struggle with finding the balance of having them read independently vs. listen to audio books. Given a choice, it’s always listening. They are mentally exhausted after reading, even short texts. Hoping to change their attitude through discussions, encouragement, and individualized goals. Hey Pernille, do you adress “what to do” when you have “Reader and Writer Haters” in your book. I definitely need some direction in this area. I have been given low EOs for ELD. Four of the students are special ed and cannot read, and 4 four of them are very vocal “haters” of both reading and writing. The rest of the class wants to learn, but my haters and specials take a lot of time and energy. I am also working on my masters so I don’t have much leisure time to read, but will definitely make reading a priority, if this issue is addressed with some ideas of how to connect with these students. Of course I am not getting any support at school. I feel like more (though certainly not all!) teachers of reading and writing have noticed this problem and worked to address it than teachers in any other discipline. Good teaching always emphasizes the importance of motivating students through relating to them and their interests and by making the learning relevant. Unfortunately, the older the children get, and the more advanced the content, teachers appear to focus on this student motivation piece less and less. Some plow on through, teaching like crazy, but probably connecting with very few learners. We have to be about the kids first– we teach kids, not ___(insert subject here)____.